April Cornell - Live Beautiful: Apron Giveaway! 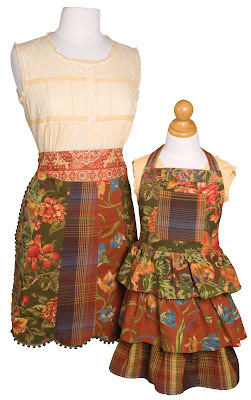 These mother daughter aprons from our upcoming fall April Cornell collection are among my favorites. We are delighted to offer them as part of Apron FEST '09. Deanna Garretson, the Apronista, is a bona fide apron maven. She is hosting a blog tour giveaway this week, and we have joined in the fun. She has gathered all types of apron fanatics, so be sure to check them all out. The links are on her blog. We'll choose the winner of these April Cornell aprons from the visitors who leave a comment to this post. Take a few minutes and share a favorite memory you have of working with someone you love in the kitchen. On Friday, we'll use a random number generator and announce the winner. Be sure to check back and see if you won. My two sisters, mother, and I were surrounded by loving aunts, grandmothers, and other family members. We have had (and still do!) many happy times working together in the kitchen (wearing aprons of course) preparing for family parties. Some of my best memories are of learning to cook from my grandmother. She used to bring me cookbooks when she traveled. I still have my first cookbook for children that she got me. Your aprons are precious! They would be wonderful to use now as well as to pass on along with the memories made in them as an heirloom to the next female generation! They remind me of the apron my now deceased Grandmother made for me as a little girl. I was very proud to have my own apron when I played cooking. I have passed it on to my 5 year old daughter, Eliana. She wears it whenever she helps me in the kitchen and it always brings back wonderful childhood memories of my Grandmother. I arrived in the kitchen ( I was upstairs taking care of a new baby boy) and I found my two daughters pinned into white ruffled aprons over their holiday dresses. Luckily my mother-in-law had 2 pretty aprons.... They were helping make dinner rolls, and she didn't want them to get flour on the dresses. They looked so pretty, that we put the aprons back on for dinner. They would have protested if I offered them bibs, but the aprons kept them neat and clean until after dinner family pictures were taken. We all love the april cornell dresses! What a lovely and cute set of aprons. My favorite thing to do in the kitchen is baking chocolate cupcakes for the kids, because once I am done all three of them will sit on the floor licking the batter bowl. Thanks for the chance to win. Gosh! Hands down it was my Grandmother. Always baking cookies, always so patient with me. She made me the baker I am today! Your work has always been such a pleasure to view and have throughout my home! I love it! This makes me think of helping my mom make coq au vin and ratatouille...mmmm can smell the yumminess now! Greetings from Quebec! I miss the stores that use to distribute your products in Québec City! Your work brings "prettiness" in this world. Thank you! Growing up I spent a lot of time in my Grandma's kitchen. We pickled beets in the summer, made homemade chicken and noodles in the winter. But my favorite by far were her made from scratch chocolate cream pies. She would always give my sister and I the leftovers scraps from the pie crust dough. We would make little shapes out of them and she would bake them. Then we would use our "crust crackers" to scrap the leftover filling out of the pan! This set is gorgeous :0) I wear aprons everyday. When I cook with my girls we all wear mathcing aprons :0) Great giveaway. I would love to enter to win mother-daughter aprons! I have a small collection of aprons, but my favorite is the little gingham one my daughter used to wear when we would work together in the kitchen. She is a young-married now, and I have saved it for her future children. April Cornell fabrics are my favorite, and I love to use your linens in my kitchen. I'd love to win your apron. I think the April Cornell line is so pretty. I wear aprons all the time. I love having extra pockets to carry things around. Plus I work at a bakery so the theme carries over at home. Thank you! I've enjoyed working in the kitchen with my grandmother but I really enjoy working in the kitchen with my kids. It gives me great pleasure to see my 3 wee ones lined up on chairs, mixing, scraping, pouring and tasting. oh my, I'm such a HUGE fan of yours!!! A favorite memory of mine is canning tomatoes and bread & butter pickles with my Mom during the summer months... in fact, I'll be doing pickles this Wednesday! One of my favorite kitchen memories was when my mother accidentally poured a dozen and a half of my Dad's business cards, belonging to his clients, into the chocolate cake batter being mixed by a running Kitchen Aid Mixer. She stood there dazed for a second looking down at them all going around and around and around! I can just see my granddaughter Zakeya, and I fixing thanksgiving dinner together, dressed in those amazing aprons. She and I love spending time cooking, dressing the table, and serving our family. I want to continue our family traditions and share with her the many wonderful times my two sisters, mother, and grandmother spent making long treasured family recipes. Thank you for helping us create more wonderful family memories. These are darling! Crossing my fingers here LOL! One of my favorite kitchen memories was back when I was in my teens ... my mom and I decided to try making our own crepes. We had such fun trying to pour and flip them just right, and then filling them with different fillings ... my favorite was sauteed mushrooms! My favorite 'kitchen' memory is making Christmas sugar cookies with my mom and sister. We made them every year while I lived at home. The best part was adding the sprinkles. I whipped up a batch of sugar cookies with my son this past Christmas and it brought back all those great memories. I think I've always loved cooking. My mom took special time with me in the kitchen, knowing it'd be a very useful skill for me one day. Now I really enjoy cooking for and with my family. Wearing a cute apron makes it all the more enjoyable. Those aprons would make any kitchen "moment" one to remember ! Beautiful ! My favorite "kitchen/ cooking" memory would be of making chocolate chip cookies with my sister who was 12 years older than me. I really started cookie making with her at age 4. My place of permanancy was ALWAYS sitting on the counter next to the bowl and of course I was always given the thrill of pouring the chips in !! We ate more dough than we baked :) Today I am 32 with 5 children and she still calls me...her "cookie"
My 1st memory of working in the kitchen was making sugar cookies with my mom and younger brother at Christmas. These are absolutely beautiful and perfect for Christmas baking (or ANY baking!) together. I would love to win them! I think my most cherished memory of baking was with my grandmother in her kitchen making Oatmeal Raisin Cookies. We baked them pretty often and somehow hers STILL turn out much better than my version of the recipe- the same one! What a cherished time with her and hopefully I'll be able to do that with my grandchildren someday. I remember after first being married I did canning with most of my dh's sisters and his mom. It was good fun. Favorite kitchen memory? I made one just this morning with my two girls, 11 and 6. We made sweet roll dough and make that into cinnamon rolls, dinner rolls and a loaf of white bread....mmm, mmm, good! My kitchen memories are still being formed with my almost-3-year-old daughter! I'm not as good as my husband about involving her in the process of cooking (he's less worried about mess) but we like to make play-dough together. She loves it- both making it, and "cooking" with it later. I'm thinking of getting her her own fancy apron for her birthday, and a future one for my 8 month old daughter too! I LOVE those Aprons!! So Cute!! Darling aprons. Most of my significant discussions with my mother (life, life changes, etc.) all came while we were working together in the kitchen, usually fixing dinner. Working together seemed to make it easier to have those talks. I loved baking pies with my mom, she always let me sneak a little of the filling! Thanks for the giveaway! My favorite memory was making perogies with my mom and the other ladies...I was covered from head to toe in flour! The aprons are wonderful! I love the memories of working on cookies in the kitchen with my children. I love working in the kitchen with my children. I usually limit the number of kids in the kitchen at a time, but it is always a lot of fun! I especially love watching them sneak tastes! So glad you are participating in ApronFEST! I am too! Those aprons are gorgeous. I remember working with my grandma in the kitchen making gnoochi that was so fun. She always wore an apron and I always got so messy. Good memories. I will never forget working in the kitchen with my mother and grandmother. My grandma would always give us instructions, and she still does. One of my favorite memories are when we canned peaches and put up corn. Most of my favorite memories are kitchen memories! Letting my kids and now my grandkids help me cook, is a special memory. Especially when they are really young and get all excited about the whole process, even washing up! Your aprons are adorable! My favorite memories of wearing an apron is actually wearing them to paint in and not really to cook in. I also have an apron that has a ribbon for scissors and I wore it for my last garage sale to hold all the change--I knew I was having a good sale when the apron was getting heavy. OMG! I heart your blog! I heart your apron giveaway even more! My first apron was the apron my Abuela (grandma) made when she was pregnant with my dad! That would make my apron 64 years old! Since then I have been collecting aprons for 20+ years. I enjoy the memories of my Abuelita in the kitchen with my Tia’s cooking and baking from scratch. We would talk about memories and such, because we were not "gossiping". Anyways, Thanks for the giveaway! Not too long ago I gathered many of my neices and nephews and own children together to bake some cookies. It was so sweet working with these children I love so much. I hope they remember it fondly, too. Growing up, my sister and I spent many summers with our cousins and a very creative aunt. There was always a kitchen project to enjoy together--from watercolor egg painting to cookie decorating to gingerbread house making. Creativity was the only requirement--and of course, the end result was always something delightful to snack on in the afternoon! What a beautiful set of aprons! One of my memories in the kitchen is making pretzels with my grandma. Now, I make them with my two daughters. We have so much fun rolling them out. . .
Its funny, but my favorite kitchen memory has nothing to do with food. I was around 10 or so and doing the dishes and my grandma kept me company by teaching me her favorite big band songs. It came in handy because when I was 18 I started singing in a big band for 6 years. I never had to rehearse because I already knew the songs! The aprons are beautiful. Some of my favourite moments are spent with my GD in the kitchen teaching her how to bake. Two memories come to mind. The first is cooking with my mother when I was a young girl and both of us trying to imitate Julia Childs and just giggling until our sides hurt. The second is much more recent. My mother who lives out of state was visiting and watching her bake cookies with two of my daughters - A memory that will not be forgotten! I would love to create new memories in your aprons with my daughters! My favorite memories are the most recent. My 9 year old son has taken up an interest in helping me cook and we have been making dinner every night together. He is so proud of making something and we get to spend some wonderful time together! I have lots of fond memories in the kitchen with my mom, grandma, daughters, aunts & even my wonderful hubby. But I think my fondest took place just a few weeks ago when my dad was in town staying with us. It was the first time in my 40 yrs. that he and I ever cooked together. It was great! Love it! I have my giveaway listed also. Hope you stop by and enter. Beautiful aprons! It would have to be my great Aunt her artistic talent was in the presentation. Her table sitting were always amazing. My mother worked while growing up so I don't have many memories of cooking with her. I have 3 girls that I enjoy cooking with now. We cook and bake all the time together. Everytime we cook and bake together we are making very special mother-daughter memories. I thank God for giving us these beautiful daughters! My favorite cooking memories are usually when I am cooking and everyone is in the kitchen helping me or just all talking at once. I love kitchen talk. Your aprons are beautiful! The memories they will help create will be priceless. Thank you for the opportunity to stir up some memories! I remember helping my grandmother make jelly and jam - she did it every year and made enough to last till the next canning season (and plenty of extras for family and friends). She's always got an apron (or 3 or 4) hanging by her back door...some probably still have fruit stains on them from all the mess I made! My favorite memories are of me and my little girls in the kitchen getting messy , baking goodies for friends and just loving every minute of it! I love this aprons - I love April Cornell! I love thinking about the times my daughter and I have made my grandma's favorite cookies for Grammie to enjoy with her morning coffee. She has had a hard time because we just lost grandpa last spring, but we feel glad to give her just a little something to make her day sweeter- thank you for this chance to have a beautiful fall apron! Have a good day! My most favorite kitchen sharing moment is one with my DAD!! His mother was a professional pastry chef, and she passed on many favorite recipes. It was my DAD who taught me how to make the most fabulous sugar cookies on the face of the earth. We had dozens of old tin cookie cutters that had been passed down from Grandma that we used to shape them. My mouth is watering right now, thinking about these cookies! The aprons are beautiful - thank you for sharing! Almost all my memories working in the kitchen involve me getting my hand slapped for "testing" the food along the way. It's a big family joke now! I have two memories that are related. First, I remember my grandma making millions of cookies for Christmas. Her counters were full of lots of different kinds of cookies. My grandpa always said he liked the burned ones! The second memory is when I worked on my Home Ed project my senior year in High School. I decided to make Christmas cookies with my grandma and create a recipe book of all the family recipes. By this time, my grandma was older, so I did most of the work. She watched me and gave me guidance. only she could tell when the cookies were done, no matter what the timer said! Beautiful aprons! As a child, I loved baking with my mom. She always wore the old fashioned 1940's aprons her grandmother wore. I can smell those cookies now. Oh my what precious aprons! Thanks for the great giveaway! What beautiful aprons. My favorite memory in the kitchen is when our daughter (now 14) was about 2, got inside of my husbands hugh stock/turkey fry pot. She held the lid over her head with the biggest smile and said I'm ready. I spent so much time in the kitchens of my Mom, Grandmother, and Aunties. They all taught me how to cook, each passing on their tips and secrets from the basics to Grandmas' gourmet cooking (and my auntie's short cuts and fun kids ideas). Mostly they passed on the joy of caring for ones family and that the kitchen is a fun place to be! My Aunt Jen taught me how to make her delicious fudge in the kitchen. Loved being there with her. Thanks for the opportunity to win! My email is katy (at) alpacafarmgirl (dot) com. My Gramma and I were in charge of all the baked goods to bring up to the lodge for Thanksgiving. This always included at least a dozen varieties of cookies, breads, and of course apple and pumpkin pies. She always packed her apron when she came to visit and encouraged me from the start of my marriage to bake, cook and sew. She has now passed on but I am sure of one thing she is still baking in heaven. My mom didn't cook -- well, she considered putting the frozen pot pies in the oven "cooking!" Today, some of my best memories in the kitchen are being created when my husband, daughter and I all cook together. It's what I have always dreamed of! My favorite memory of working with someone I love in the kitchen was 2 years ago when my grandmother came over to show me and my mother how to make her famous Sausage Dressing for Thanksgiving. I had to grab my camera and document this special moment of four generations, (my grandmother, mother, me and my daughter), all cooking together. Makes my heart warm just thinking about it. My mom had a stroke about 5 years ago when she was only 44 and it was terrible and frightening! She lost the use of one arm, and her fine motor skills as well as her speech. But it's so nice to go over there sometimes and cook with her. She gets out food she wants to put together and the spices and she teaches me as I do all the work. She makes a great meatloaf and I'm pretty sure I could do it myself now. Cooking with her helps me to reconnect with her sometimes because we don't have to worry about trying to understand one another. It's a blessing even in a trying time. I always had the job of peeling onions with my grandma for thanksgiving dinner. Creamed onions are my favorite! These aprons are adorable! I love the set! I wear my aprons everyday! I also have fond memories of my Grandmother making my favorite Spaghetti! Now that my mom is gone, I really cherish the memories of making cut-out Christmas cookies with her. I have yet to taste one that melts in your mouth like her recipe did! Our decorating wasn't the prettiest, but they sure always tasted great. As a little girl, my mother made for herself and her mother sheer chiffon aprons with Christmas trees embroidered on them and beautiful real cotton lace trim. One was a red apron, the other green. The aprons symbolized a season of family: it was family from near and far gathering for early Christmas breakfast, Church and Santa Claus. It was huge family dinners at one of the grandparents. The aprons held Christmas memories from year to year, in carefully wrapped tissue. We remember past years as we unwrapped the pretty holiday aprons that my mother made, long, long time ago. When memories were being made to be held onto for today. Every year near Christmas my husband joins me in the kitchen and we makes batches and batches of the cookies that his family made when he was little. Now are little cookie eaters know all about traditional Italian cookies. I remember baking with my sweet grandma (who has since passed on) - She would let me choose from all her aprons and I would always pick the most frilly one. Then she'd make every kind of cookie I suggested and would store them in these 5 gallon ice cream containers. She would always have a truckload of goodies when grandkids came by. My daughter (who I named after her) loves helping me bake cookies and I like to think that my sweet grandma is baking right along us in spirit. My grandmother taught me how to make chicken soup from scratch. I still use her recipe but I don't have her knack at making the noodles. Love the aprons! I just love when it is time to make holiday cut out cookies with my kids! I remember doing it with my grandma and my mom! Great memories! 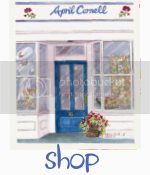 I first discovered April Cornell creations at the store on the Pearl Mall in Boulder, Colorado years ago. It was my favorite place to visit every time I was in Boulder. Now I live in Idaho and I miss that wonderful store very much, although, luckily I can find bits and pieces of April treasures in wonderful stores in the Sun Valley area. I'm delighted to have discovered the blog. Deliciously fabulous stuff! Best kitchen memory: Licking the spoon while a warm spring breeze wafted through my Grandmother's kitchen. I have a wonderful, vivid kitchen memory from the 50s--it is my grandFATHER wearing a very 50s style apron in the kitchen, with a hand mixer in his hand, making mashed potatoes. The table is chrome and formica. Fiestaware is on the table. The colors of the kitchen are bright and warm and happy. It is my favorite kitchen in my mind's eye and my heart to this day. I have wonderful memories of working in the kitchen with my mother-in-law. She was a wonderful cook and I learned so much from her. I remember one time at Christmas we tried to roast chestnuts in the oven. We didn't know you had to punch a hole in them and when they got hot they started blowing up in the oven. For some reason this gave us the giggles. They were popping and we were laughing. My husband didn't think it was at all funny. This made us laugh even harder. I'm sad to say she has been gone now for several years and I sure do miss her. My best memories from the kitchen are of making angel food cake with my aunt when I would visit her overnight. She would let me use the electric mixer, and then would insist that we couldn't even be in the kitchen until after the timer went off for the cake to be done, as any noise might make the cake fall. We always had the tallest angel food cakes, thanks to that! Aprons make me think of my grandmother - she recently passed away and when going through her belongings we found some so well-used they were thread bare. These aprons you have are gorgeous...a far cry from the utilitarian ones you used to see. My memory is helping my Mom bake pies. I would always sneak pieces of dough to eat. The dough doesn't really taste that great anymore! My favorite memory of being in the kitchen was making cookies with my mom at Christmas along with making apple dumplings in the fall. My mom used to let me help and we would use up the entire table making cookies, and we would make a mess but it didn't matter. She let me help in all aspects and didn't say anything when I would roll them out too thin sometimes so they woudl get too crispy. It was just a day of fun and eating cookies. She would let me eat some of the cookies as they came out. The same thing with the apple dumplings. I would eat the peel as she peeled them, I used to love to put the sugar, butter and spices down in the middle of the cored apple and then cover it up with dough. Oh how much fun! I love to bake in the kitchen with my 4 yr. old daughter and would love to win these matching aprons. Thanks for such a great giveaway! I remember letting my twins break and whip eggs for the first time. Oh what a mess!! My favorite memory, and I have pictures to prove it...., is when I decided to make a family dinner all by myself. It was a Saturday night in Northern Maine, so, of course, I had to make Baked Beans from scratch, and biscuits. Oh those biscuits! They always looked easy to do when I was helping my Mom or simply watching her, but to actually get the consistency correct for nice fluffy ones instead of hockey pucks, well, that was another story! I got a bit frustrated and the pictures prove so, with me sitting on the floor, despondent face, and flour all over myself. Eventually I did feed my sisters and parents though. Mom may have had to help me in the end. My favorite kitchen memories always center around my grandmothers kitchen as a small child. She and her sister used to go crazy on the holidays preparing food for over thirty family members. I loved to stand around, getting in the way as they bustled about from stovetop, to the two old wall ovens while everything bubbled and stewed. Once in a while, they would give me a task to take on, and I could work on that and soak up the energy in that kitchen. My name is Carissa Moore, I am nine years old and I live in North Vancouver B.C. Canada. I have always saved my money for April Cornell dresses since I was very little and am always grateful for my choice of which way to spend my money. At home our kitchen is clothed with things from April Cornell and I have always wanted an April Cornell apron to go with it, for when me and my mom cook together. I bake a lot with my mother and my favorite memory was when we baked gingerbread men for our school christmas play. We got icing all over the table (yum yum!) but it didn't matter. When the gingerbread men were in the oven I sat by the timer and watched each second go by. I'm glad I got a gingerbread man before our school play because by the time I found them after the play there were none left! At least I'd gotten to bake them which was fun! I am so happy now that you are opening a Canada website so I will be able to enjoy your beautiful clothing again since the La Cache stores closed here. These flowered aprons are my favorite aprons of all and I sure hope I get one someday!!! My daughter is now five and she loves to help in the kitchen. We like baking and making breakfast together. She likes to flip the pancakes and scramble the eggs. We would love to win those beautiful mother/daughter aprons. Thank you so much for offering them. I love to look at the permanantly stained green piece of woodwork in my kitchen. My daughters often liked to make "potions" in the kitchen when they were little. I didn't know at the time that they found the food coloring and were going to town! These aprons are fantastic! My favorite memory has to to with aprons! My Greatgrandmom made my grandmom, my mom, me and my doll matching patchwork aprons. We would make cookies together and I felt so loved! My fondest memories in the kitchen are from my childhood, when there were four generations in the kitchen preparing a holiday meal Italian style. My mother, my aunts, my grandmother and great grandmother. From these ladies I learned to trust my instincts in the kitchen, to not only depend upon smell and taste, but also on how things feel and their texture. It was a wonderful way to learn - surrounded by love. I fell in love with these two aprons when I saw them. I love the fall and these colors were just so pretty. Your aprons are sensational!!! I have lots of kitchen stories. Too long to post a comment on them. I used my apron for rubbing my food handled hands on! Doesn't that sound awful? Everyone needs at least a half dozen aprons!!! Preferably hand made. My favorite pie story involves a lemon meringue pie made by my mother when she had a lemon tree at their winter home in Scottsdale, AZ. She made beautiful pies, with perfect meringue, until the time she calmly walked out with a lemon pie that was the color of Ritz royal blue fabric dye. Oops, that wasn't vanilla, that was blue food coloring she added! Never peeped a word about it, just toddled on out with that amazingly blue pie. I remember hearing the first rule in food presentation is "no blue food", and I think as we ate the pie with our eyes closed, we could attest to the truth in that statement.